Madam Luo Shu, the President of Ramu Nico Management which runs the controversial Chinese Metallurgical Construction company’s (MCC) Ramu mine operation, has blocked internet access to this blog for all MCC staff in Papua New Guinea. China is often criticised internationally for its strict media censorship and for blocking access to the internet for its 1.3 billion citizens as well as other human rights abuses. 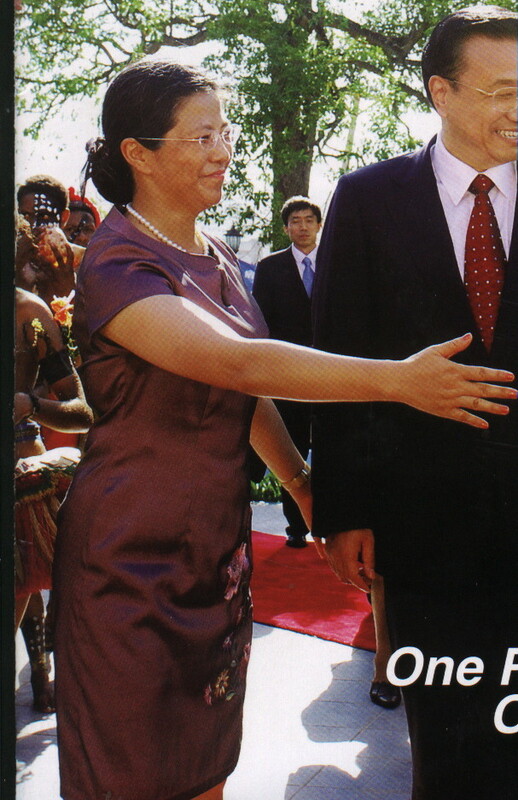 Clearly Madam Lau intends that MCC operations in Papua New Guinea will be run along similar lines. Perhaps she is forgetting that Papua New Guinea is not a communist dictatorship but a liberal democracy where free speech and human rights are not only respected, they are deeply enshrined in our Constitution. Mine Watch is now watching to see how MCC’s Papua New Guinean staff react to the censorship and how the company’s media spin doctors (who up to know have refused to comment on stories posted on our Mine Watch blog) will defend Madam Lau’s actions. Gambling, prostitution and alcohol consumption are unhealthy social activities that are on the rise in the Ramu nickel mine region according to a report presented earlier this month to the Madang Provincial administration by the Provincial Mines Office. Provincial mines director, John Bivi, blames the increase in unhealthy social activities on the influx of people into the Kumbukari special mining lease areas. “There is an increase in activities such as gambling, prostitution and drinking” Mr Bivi says in the report. The reports also states that local landowners, who are facing forced evictions by the police, are facing a lot of problems with settlers, particularly from the Highlands region, and this is leading to confrontations. According to one villager interviewed for the report, the mine company has polluted the Gagaiyo River, which local people use for cooking and washing, and its natural beauty has been damaged. Villages also claim the construction work has already destroyed their drinking water supplies and the company is having to truck in water for them. They also say that the company is only offering one small house for each extended family – forcing three generations with multiple children and grandchildren to live in cramped and squalid conditions. Compelling new video footage shows the appalling state of the main Lae-Madang highway where road users were forced to sleep in their vehicles for two nights after recent heavy rains washed mud from the Ramu mine pipeline construction across the road, totally blocking traffic in both directions. Previous videos posted on this blog have shown the extremely poor quality of the Chinese construction work along the 140km tailings disposal pipeline for the Ramu nickel mine and previous compalints about the lack of compaction, no drainage and absence of retaining walls have now been substantiated by the large landslips caused by heavy rain which is a constant feature of the Madang weather. The latest videos graphically shows the anger of road users who blame the Chinese mine company and the National government for the terrible condition of the road. The shoddy workmanship by the Chinese mine company; the lack of government oversight and the governments failure to invest in our road network are all symptoms of the widespread corruption that is crippling our nation. The source of the K40 million has been a mystery – although the whisper on the streets has been that the money has been given by the ‘kongs’ (a common slang word that is used to refer to anyone from SE Asia). But now the Sunday Chronicle has published allegations from unnamed opposition MPs that a ‘large asian mining company’ has provided the funds. There is only one large asain mining company operating in PNG – the Chinese Metallurgical Construction company which is developing the huge Ramu Nickel mine in Madang province. So has CMC provided K40 million to the government of Michael Somare to defend itself against a vote of no confidence? Perhaps we will never know the answer to that question. Though it would seem to make sense for the Chinese given the controversy over their mining operation; the questionable environmental permits for deep sea tailings disposal and coral blasting; the shoddy construction work for its 40km tailings pipeline; and complaints from local people over working condistions, land theft and other human rights abuses. 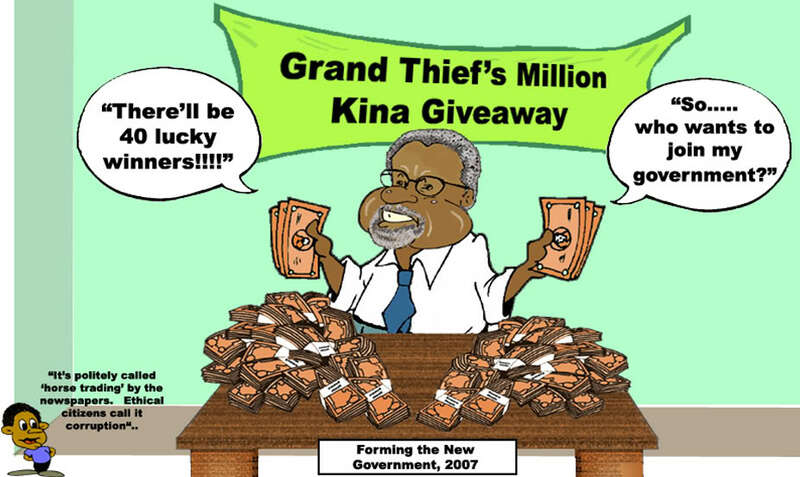 It is hugely ironic that Prime Minister Somare, who is widely rumoured to be about to try and clean up his governments image by sacking Minister’s Pruaitch and Tienstein, is at the same time accused of accepting a massive slush fund to buy off the support of his fellow MPs. MADANG Governor Sir Arnold Amet says he is unimpressed with how the Chinese Metallic Company (MCC) is handling its obligations to the people, reports The National newspaper. MCC is the operator of the Ramu nickel mine, . Sir Arnold is angry at how isolated the company is in its operations in the province and lack of concern for the livelihood of the people. “The people must be of paramount importance to the developer and the State,” he said. “MCC has some social obligations towards the people which need to be addressed but they have failed. “The people should be allowed to participate in the development as well as looking into their social concerns that will adversely impact their lives. “MCC and the National Government should also ensure better consultation with the people who must be well informed of issues that are likely to affect them,” he said. Sir Arnold said the mine should make it its business to organise a road show to inform the people of the environmental impact the mine is creating. He said he was unaware of the proposed coral reef blasting and the stakeholders like the Mineral Resource Authority, and the Department of Environment and Conservation should inform the people and the provincial government of their activities. “If any new development is taking place, besides what has already been approved, the people need to be informed,” he said. The management of Ramu NiCo said they invited Sir Arnold, Fisheries Minister Ben Semri, Madang provincial administrator Joseph Dopar and other members of Madang provincial executive council to Ramu NiCo Madang office for a consultation meeting last Friday to maintain close consultation and dialogue. They said they exchanged ideas on matters and concerns including the implementation of MoA duties, relocation exercises, and land title disputes. They said Ramu NiCo would continue to work closely with all stakeholders to ensure Ramu DSTP will be built in accordance with high industry standard and employ the best available practices. The implementation plans have been continuously updated to the Department of Environment and Conservation, which recently granted the confirmation following document review and site inspection. Madam Luo Shu, president of Ramu NiCo and Sir Arnold agreed to facilitate regular consultation meetings leading up to the project commissioning stage. A formal consultation meeting involving more local stakeholders including landowners has been tentatively scheduled for late March or earlier April, while regular exchange of information between the management and the provincial government agencies will continue. Ramu NiCo said they will be conducting awareness programmes withproject area landowners. Disturbing new pictures from Madang show how the Chinese owners of the Ramu Nickel mine are already dumping industrial waste along the shoreline of the picturesque Basamuk Bay. But this industrial pollution will soon be dwarfed by the dumping of 100 million tons of mine waste into the pristine waters of the Bay. The Chinese claim the waste is harmless; though this is disputed by Tom Wagner from the University of Papua New Guinea who has described the waste as a ‘toxic’ mix. What we do know is that many ‘civilised’ countries have banned the dumping of mine waste in the sea. But Wari Iamo, Secretary of the Department of Environment and Conservation and long-term supporter of logging, oil palm and the mining industry, has deemed it okay in Papua New Guinea.